Gospel music can be experienced in many different ways, each with its own appeal. There are the mass choirs that work it out for an entire song, or that maintain the praise and worship tone for the song leaders and chosen soloists. But the gospel message can be just as effective within the sweet intimacy that defines the gospel quartets, with tight and swift harmonies. Their urgency to the praise and worship table remains forceful today, just as it did nearly a century ago. Historically successful names such as The Five Blind Boys of Alabama, The Mighty Clouds of Joy, The Swan Silvertones and The Clara Ward Singers have illustrated the inviting spirit of the gospel quartet genre. 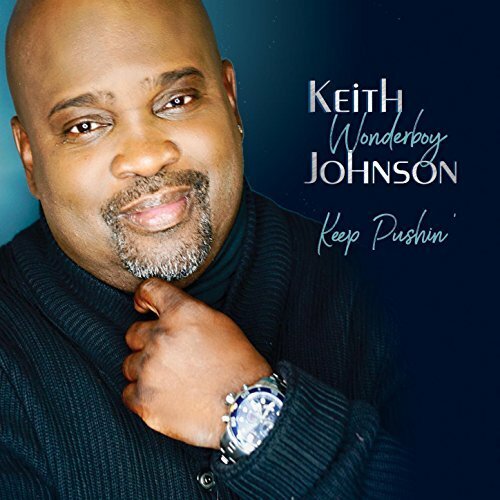 One representative in the current generation of quartet excellence is Keith ‘Wonderboy’ Johnson, who brought us "I Just Want to Be Right, "Let Go, Let God" and "Chilly Winds." His gutsy vocal sweeps, preaching moments and effortless blending of R&B, soul, funk, pop and gospel alongside The Spiritual Voices, keeps extending the genre, landing several of his CD's on the Billboard Gospel Chart. Besides his artistic contributions for almost two decades, Johnson serves as an ambassador for aspiring quartets some who were introduced on the Stellar nominated, The Rising Stars of Quartet, in 2008. With his first recording since 2013's Day by Day E.P., Johnson joins the Shanachie Entertainment family for Keep Pushin’. For the most part, very little has changed in Johnson’s arsenal, respecting the quartet tradition while adding his trademark contemporary flavors. In a seamless flow of then and now, "Can’t You See God Working" marries that quartet call and response with a touch of funk. "I’m Gonna Make It" drops a modern minimal twist. Shifting to older school, southern soul grooves rule with "The Man." The eighties/nineties R&B slow burners, "God’s Gonna Do It" and "I’ll Praise Your Name," further accentuate Johnson’s animated vocal presence. However, the usually vibrant Johnson feels quite comfortable in a quieter urban worship atmosphere with the semi-unplugged, Psalms 145:3 based, "O Lord We Worship." The one hiccup on the album is the Johnson's sincere attempt to give props to the architects of the Minneapolis Sound on "God is Able," a cut that mirrors too closely The Time’s "Jungle Love," and which ends up an album outlier. Though Johnson's musicality runs deep, his happy zone belongs to the traditional quartet roots as demonstrated on "You Ought To Testify" and the fully engaging, foot-stomping title track, the latter featuring an entertaining, amusing video. Keep Pushin unquestionably realizes Johnson's strengths, and takes vision of how a gospel quartet can sound to further heights. Solidly Recommended.